Immaculate timing to up-date and expand the excellent 1930’s book Songs and Slang of the British Soldier by John Brophy and Eric Partridge. Martin Pegler embraces their earlier work, which, due to censorship, had to omit much of the slang verses of songs, which had been considered at that time too crude for inclusion - even a revised 1965 version was heavily edited. 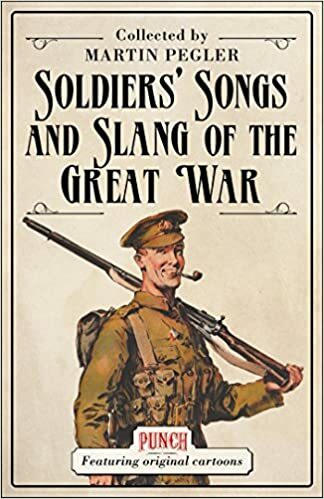 This doesn’t mean that Martin Pegler’s up-dated version is crude, it isn’t, it’s a fascinating journey that gives an honest, true-to-life collection of songs, fabulous illustrations and, of course, a dictionary of slang used by the soldiers who endured trench life. The alphabetical list of Military Slang, Terminology and Popular Phrases encompasses an enthralling lexicon from AAA – Ack, Ack, Ack – ‘Stop’ on a Morse buzzer, to a Zig-Zag – a drunk - from the wobbly walk of a man full of alcohol. There are almost two hundred pages of discovery. Part two is a spiffing collection of songs; so important to the serving soldiers of 1914-1918. Singing raised morale, and a good marching rhythm helped Regiments move around the countryside of France and Flanders, and indeed Blightly. A further one hundred and fifty pages of songs are included in part two; anyone reading this book will end up singing along – so it might not be a good idea to read it on the train. Most know the chorus to It’s a Long Way to Tipperary, but few will know the verses, or the alternate version: That’s the Wrong Way to Tickle Mary. There are, interspersed throughout the text, a number of images from Punch Magazine and Bruce Bairnsfather cartoons, postcards and posters, many from the author’s private collection. As a writer and researcher of this era, I have found Soldiers’ Songs and Slang of the Great War to be a treasure chest of enlightenment and would like to thank Martin Pegler for sharing his knowledge in this wonderful book. Do you know what ‘mongey’ means? Or where the word ‘plonk’ comes from, or what a Silent Percy was? You will if you buy this worthwhile book.